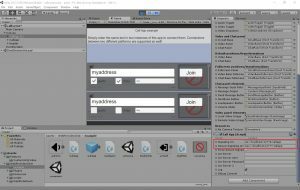 Server side info & Tutorials | Because why not? 1.4 Which one do I need? There are three kinds of servers the assets WebRTC Video Chat & WebRTC Network can use. Note that the two assets are identical in their server & network requirements and if the client side is referenced it will be based on the CallApp example of WebRTC Video Chat. The users are now connected directly. The signaling connection will be cut to conserve server resources. This all happens automatically due to the siganling server. All the user (or an external software) needs to do is exchanging a shared address that can be used to start the process. Also note that this process isn’t fixed. If you work with the IBasicNetwork & IMedaNetwork interfaces you can keep the signaling server connection alive and thus allow multiple users to connect instead just two. One of the two types of ice server. The use of STUN is part of the native WebRTC implementation and defined in RFC3489. It is needed to establish connections through a router / NAT. As most users will be behind such a device you will generally need it for any connections that aren’t inside your own LAN or WIFI. Stun servers are used during step 4 in the scenario above. They will help opening a port and find the routers ip address (also often called public ip) of each users. During the signaling process the users will exchange these IP’s with the other side and in step 5 they will then attempt to connect to them (and many other possible IP’s). As stun servers are only used for a short moment, a single server is usually enough for many thousands of users. Because of this you can also find free stun servers online e.g. “stun:stun.l.google.com:19302” (blocked in China though). TURN servers such as the application “coturn” support STUN as well. So you won’t need two different server applications if you plan to set up your own. A TURN server will be used to forward messages between two peers. This will happen entirely automatically and it won’t be visible to the user nor the software. It will look and behave exactly like a direct connection. As the data doesn’t flow directly between the two users though the latency can be much worse. This is especially true if the TURN server is far away from the users. If you still develop your software or you are a hobbyist who doesn’t plan to publish the software to a wide audience you won’t need any server at all and can simply keep using the default servers supplied. The only disadvantage of this is that I can’t always guarantee the servers are available as they might be overused at some point. Signaling server is needed. No stun and no turn needed. The app needs to connect online. Mainly private / home users. A lot of businesses have their firewalls setup to not allow direct connections. You should setup all servers including turn servers. Some users might still not be able to connect even with TURN. This could mean a firewalls is used to only allow HTTP / HTTPS data or even proxys are used. See section Additional Information. You find all important files in the server.zip within the asset folder (or WebRtcNetwork subfolder for some older versions). WebsocketNetworkServer.js – contains the logic. It is simply a list of addresses in use and the users that are connected to these addresses + code to forward. This triggers the normal websockets to listen on port 12776 and it will listen on all available ip’s. httpsConfig will do the same for secure websockets. If you plan to use secure websockets you will need to replace ssl.key/ssl.crt with your own certificate. If you don’t want the server to listen on ws or wss simply remove the whole httpConfig or httpsConfig object. Note that it is recommended to use port 80 for websockets and port 443 for secure websockets. 12776/12777 is just used to avoid errors as port 80 and 443 are commonly used by other apps as well. Some hosting providers don’t allow you to pick any port. In some cases the PORT environment variable is used by the server and the settings in the file is ignored. In this kind of setup often only one port can be used thus either httpConfig or httpsConfig has to be removed. This setting protects the server from oversized packages which could easily fill up its ram and slowing it down / crashing it. Apps are used in the address behind the last /. They allow you to use multiple apps with a single server without the risk of connecting two different apps mistakenly to each other. “address_sharing”: true is a hack currently used to allow multiple users to receive incoming connections on the same address. The signaling server will connect every user to all other users who listen to the same address instead of returning an error. Currently, WebRTC Video Chat and WebRTC Network don’t have a public interface to use the signaling server directly. Instead, it is called indirectly via the IBasicNetwork, IMediaNetwork and ICall interfaces. The WebRTC Network ChatApp uses it to create a server / client structure. One user can open a chatroom . That user will be the “server user”. Many other users “client users” can then connect directly to the “server user”. The client users will only use the signaling server to establish a direct connection and then cut the signaling connection. Only the server user will keep the signaling connection alive. WebRTC Video Chat doesn’t make a distinction between server and client. Every user will try to be the “server” role first and try to use the address. If that fails they will connect as a client. 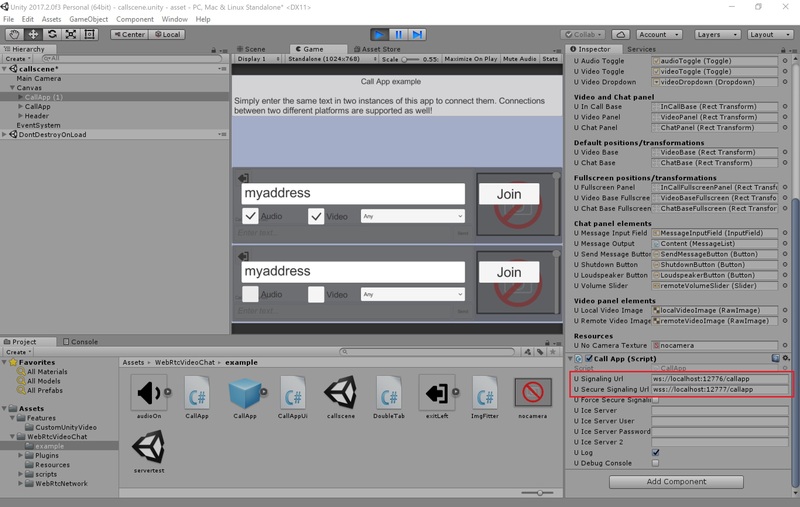 Once the first client connected both users will cut the connection to the signaling server while continuing their video chat without any server. A typical example for wrapping the signaling server: A lot of businesses already have a server that handles usernames and passwords to identify users. In this case an existing system can be used to generate a token. That token can then be used as an address for the signaling server(using secure websockets!). The two users can then establish a direct connection and cut the signaling connection immediately after it. This allows other systems to use the signaling server without having to change the software itself. A similar approach can be used to extend the functionality: instead of adding new features to the server itself you can create your own server software that deals with your specific business logic and only generates and exchanges random tokens when people actually need to connect directly. An example for this is adding a “phone ringing” effect. For this you can connect users directly first (e.g. via WebRTC Network). Then they can request a phone call using your own custom protocol. The other side receives the request and starts to play the ringing animation. After the phone call is accepted a random token is exchanged which then can be used to establish the direct video chat connection. Of course if you are not too worried about backwards compatibility feel free to change the server itself. A typical use case for this is to get access to the list of available addresses in use (which can be a security risk for other use cases thus won’t be available by default). Before trying to run something on a complex server setup it is usually the best to test locally. This scenario assumes you are using Windows but should work fine on Mac as well. It should return a version e.g. “5.5.1” for npm and “v8.9.1” for node.js. If this fails you might need to make sure the binarys are in your PATH variable. You should find more about this via node.js documentation Also some systems might have a very old node.js version pre-installed. If node.js returns a version with a leading number 0 your version could be too old to run the server properly! 3. Extract the signaling server in the folder of your choice. You can find it in the WebRTCNetwork/server.zip for both assets. This means the server can now receive incoming websocket connections on the port 12776 and secure websockets on 12777 for all available ip addresses on your system. The newer versions allow you to quickly test if the server is accessible via the browser using http://localhost:12776. It should print “running …”. Note that testing the secure connection isn’t very realistic on local host as the ssl.key and ssl.crt files of the signaling servers are not created for your specific system and aren’t created by a trusted certification authority. At version 0.98 the native version will still allow secure connections even without a trusted certificate. This might change in the future though. The Unity CallApp setup should look like the following image. Make sure to set both CallApp’s to the correct settings. This means it received the request to use the address “myaddress” and by responding with the same message the server confirmed the address is now being used / reserved. As you can see first the server responds with a “ServerInitFailed” message as the second app will attempt to reserve the same address. The CallApp then knows that the address is already in use and instead tries to connect to the existing app. After these lines you should see the content of the WebRTC SDP messages and ice candidates that are being exchanged. Now the two apps should now be connected directly to each other. The signaling connection will be cut by both apps. Same as above. You only need to make sure that no firewall on the system you use as server blocks the access (typical the Windows Firewall is the reason for most problems). If the firewall is configured properly you can simply use your computer name or LAN/WIFI IP address instead of “localhost” to access the signaling server within your LAN/WIFI. You rented a typical virtual machine / linux root server. For many cases a simple 5 USD / month virtual machine is enough. Now follow the steps starting step 2 from Signaling Server – local setup above. This will copy a folder named “localfolder” to your server user’s home directory subfolder called “serverfolder” (folder needs to exist already). If you copy a signaling server folder over that has been used before make sure to remove the “node_modules” folder first. This is being recreated once “npm install” is run. Note that unlike npm commands earlier this is installing it globally (-g) not just the signaling server project. This command itself won’t do anything but print the steps you have to take to ensure pm2 will be started during the boot. It should just be a single command you need to copy&paste and run. To save the currently running application list. These application will then be started automatically after the next boot. and the certificate of the certification authority. It looks pretty much the same as the certificate. To add your certificate to the signaling server you can open the SSL.key file and copy&paste the private key into it. The same for the SSL.crt but here you should add both: the certificate and the CA certificate into the same file. For security reasons make sure only the user used for nodejs can access the key. Note that certificates are only valid for a certain time. You will either have to regularly update these files or use a tool to automate this process. First go to https://certbot.eff.org/ and select: I am using “None of the above” and then choose your system. It should then show you the install instructions. After following them the “certbot” command should be available. Now we have two options. option b: –webroot same as standalone but instead uses the build in web server of the signaling server. httpConf.port needs to be set to 80 in config.json and need to stay at port 80 for the certificate to be able to update in the future. -w is the absolute path to the subdirectory “public” of the signaling server. -d you can add multiple domains that can be used to access your server. –config-dir,–logs-dir, work-dir set folders that will be used to store the final certificates, logs and other files. You can also remove these and run certbot as root instead. In this case the files will be stored in default directories e.g. config dir will be /etc/letsencrypt. Note that using root might interfere with other services / application using lets encrypt running on the same server. After running the command certbot will ask you multiple questions. After you answered them it will let you know where it has stored the files fullchain.pem and privkey.pem. fullchain.pem contains the certificate + CA certificate. It can be used to replace the example ssl.crt. The privkey.pem contains the private key and can be used to replace ssl.key. Either change the config.json to use the files (make sure the user that runs node.js has access rights!) or copy file files over ssl.key / ssl.crt. Depending on the lets encrypt package you received it might update automatically (this never worked for me). It is best to add an appointment in two months to your calendar and make sure your renewal works! If it fails browsers will refuse to connect to your signaling server after 3 months. This will install the application “turnserver” and also change some system configurations (such as adding user and group “turnserver”). –listening-ip flag isn’t always needed but recommended to ensure the server doesn’t listen on an address it might not have access to and end up returning an error. Make sure the IP is a local IP directly available on the host which might not be the same as the public / external ip! –user testuser:testpassword Sets username and password for the turn server (by default not needed for stun!). Note that this is just one of many ways of authentication coturn supports. Optional: The –daemon flag can be used to make sure the application runs in the background and stays active after logout. Remove –verbose after you tested the server to reduce the logging spam. 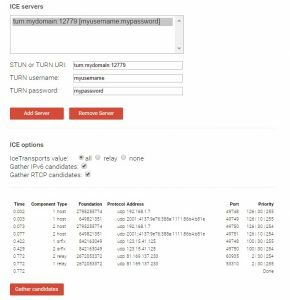 You can use the tool trickle-ice to test your server. “host” entries are the entries connection directly via LAN / WIFI to your system so you can ignore these to test your server. “srflx” shows the entries provided by STUN and “relay” entries provided by TURN. After pressing “gather candidates” the “relay” and “srflx” entries should appear. This process can take up to a minute if one of the addresses is slow to respond or unavailable. If you used –verbose to run the turnserver it will also print debugging output information for each connection attempt. If this isn’t the case you might need to check your server settings, url, port and hosting specific firewall / NAT settings. You can also use the URL: “stun:yourdomain.com:12779” without a username / password. In this case only stun is used. The relay entry will be missing. Instead of adding everything via command line flags for a proper setup it makes sense to use the file “/etc/turnserver.conf”. This file is automatically used if the turnserver is started. The configuration properties correspond one to one to the parameters for the command used above. You can test the settings by running “turnserver” again without the additional command line flags. To ensure that coturn will start to automatically edit the file /etc/default/coturn (as root) and remove the # sign in front of TURNSERVER_ENABLED=1. Restart your server and use run “ps -A” to make sure “turnserver” is shown in the process list. By default you can find the log files at /var/log/ starting with “turn_” but you can change all these settings via the turnserver.conf file. Run the signaling server on the default ports 80 for ws and port 443 for wss. Some firewalls (often used in bigger companies) will block all ports except these two. You might need to use the setcap command to give the process access to it. Also ensure no other webserver application is already using these ports. (use with care. Not yet tested on all platforms / versions) Run the turn server on TCP port 443. Firewalls often block all protocols except http and https. By using the default port for https + TCP many firewalls can’t distinguish the two protocols thus let TURN pass. This sadly also means you can’t run the turnserver on the same IP address as a web or signaling server! This url will make only turn available. You need to add stun as an additional IceServer entry. Use different hostnames for each service such as signaling.yourdomain.com, stun.yourdomain.com and turn.yourdomain.com to be able to move servers without having to update your application. Study the coturn documentation. It has a lot of features for better authentication. If you just uses username and password others might be able to find these in your application and then use them for their own purposes. Ideally set up your own (or use an existing) system for authentication of users. Share stun, turn and signaling url’s only with authenticated users. You can change the signaling servers source code to ensure only known users can connect. It too can be abused to forward data via your servers.